Single origin coffees, roasted in Dorset — Beanpress Coffee Co.
Our journey in to coffee roasting began in 2010 at our coffee shop in Poole, called Little Red Roaster. Here we roasted coffee in 2.5kg batches on a small machine we imported from Turkey. We roasted a variety of coffees for our customers to enjoy in the cafe, and at home. 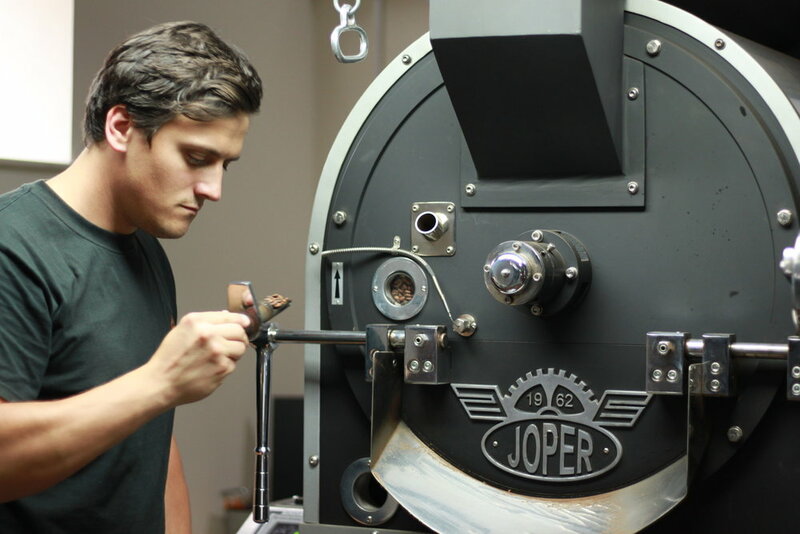 In 2013, we needed to increase our roasting capacity, and purchased a 25kg roasting machine from Joper in Portugal. For nearly 60 years, Joper have manufactured traditional cast-iron coffee roasters in their factory in Vila Nova de Gaia, on the opposite side of the river Duoro to Porto, in Portugal. Since purchasing the Joper, we’ve been roasting in a converted farm building, in rural Dorset. We now roast coffee two or three times per week, supplying fresh coffee to restaurants, cafes and hotels across the county and beyond. At the roastery, we also have a studio where we run training workshops and discovery days for our wholesale customers and the general public. Since 2013, we have travelled across the world visiting the coffee farms that produce the coffees that we buy, and have developed relationships with producers, exporters and importers, many of whom we count as personal friends.